RF Cascade Workbook 2018™ has all calculations on a single worksheet to make inserting and deleting component columns simple - well, relatively simple. 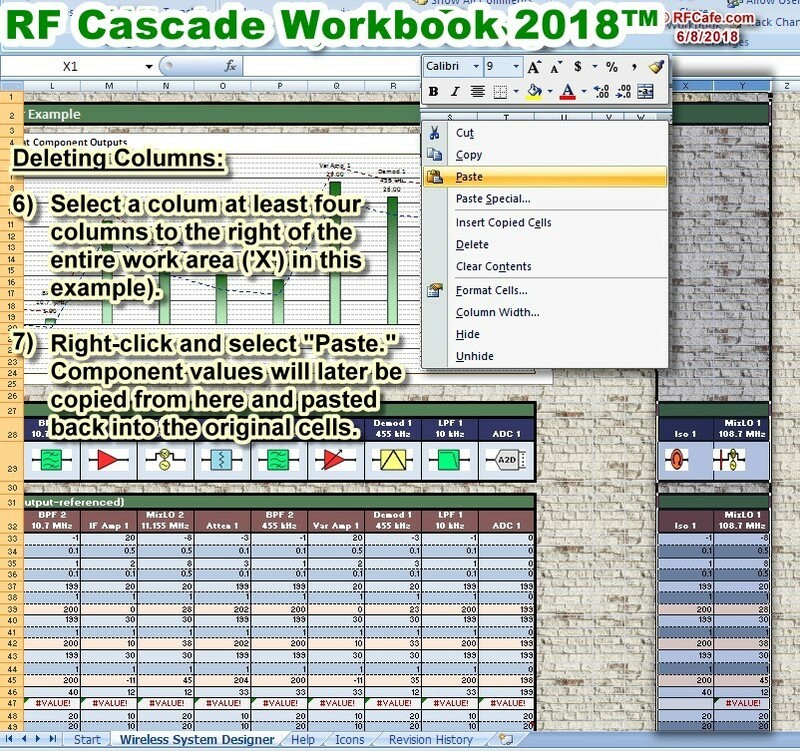 There are certain rules that need to be followed in order to assure that all the formulas retain their proper references to other cells' values. 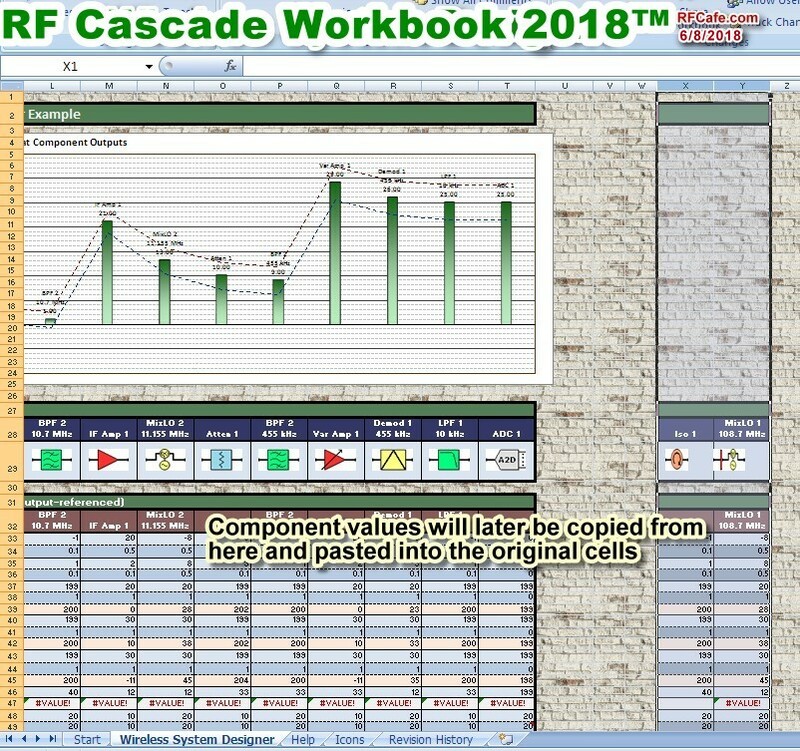 RF Cascade Workbook 2018™ does not require any special steps that are not common to Excel or other spreadsheets, but it is probably safe to say that most users are either not familiar at all with the procedure, or do not use it often enough to be confident without a reminder. I have outlined the necessary steps and done screen captures as needed. 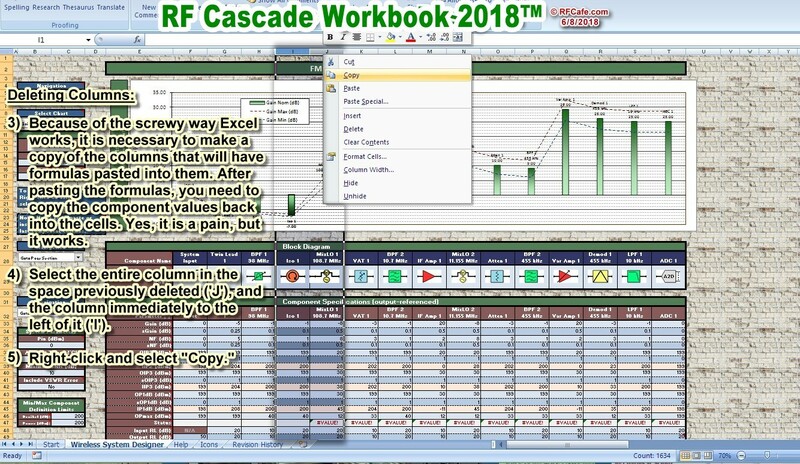 * Rather than Deleting columns, I recommend using Excel's "Hide" feature to prevent system component columns from appearing on the screen or on the charts. A hidden cell's contents is still included in the cascade calculations, it just is not shown on the screen. 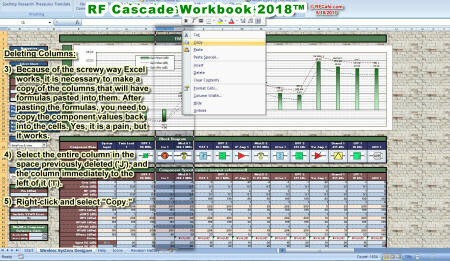 Note: When columns are inserted or deleted, Excel conveniently adds or deletes, respectively, data sets to the Line Charts. 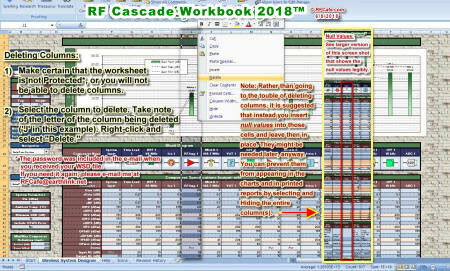 Scatter Charts do not automatically add or delete data sets. 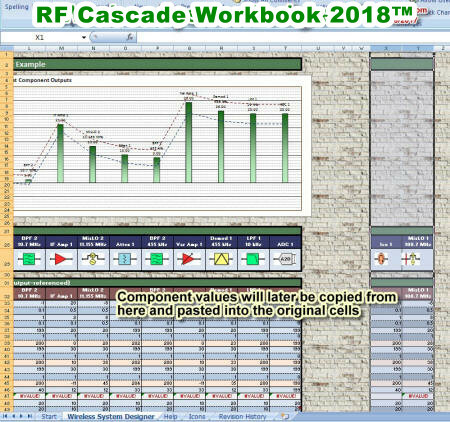 Fortunately, the only Scatter Chart is the Frequency Response graph that plots signal power levels inclusive of filter rejection. 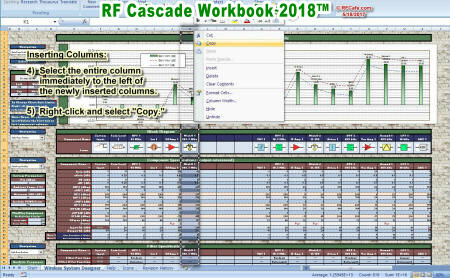 Therefore, it will be necessary to separately modify the Frequency Response chart after adding or deleting columns. 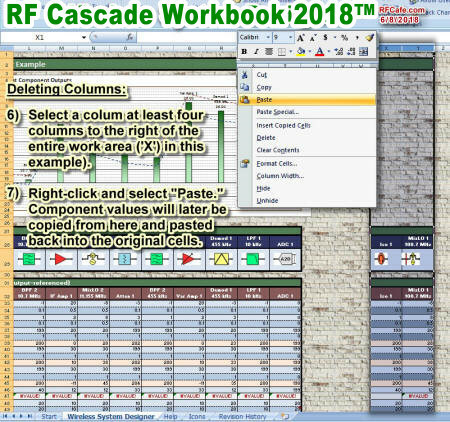 NOTICE: I highly recommend that you make a backup of the original version of your workbook before adding or deleting columns just in case something goes awry. 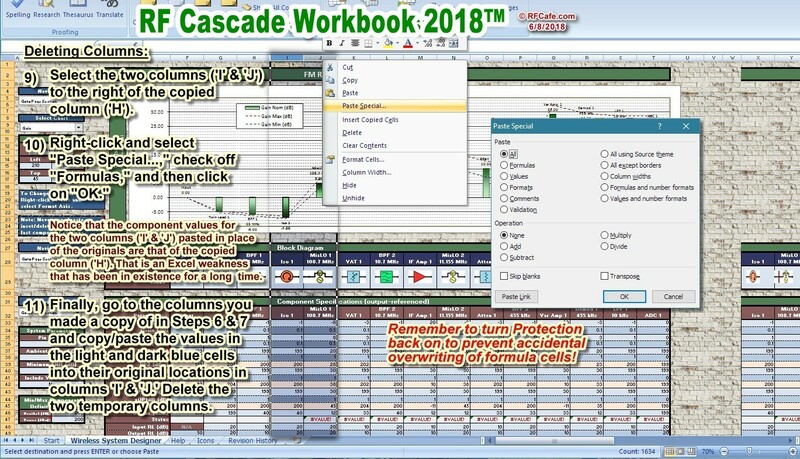 Excel only allows you to Undo edits up through the last time you save the file, so if you make changes and save the file, then make more changes and discover that your mistake occurred prior to that last save, you're out of luck. 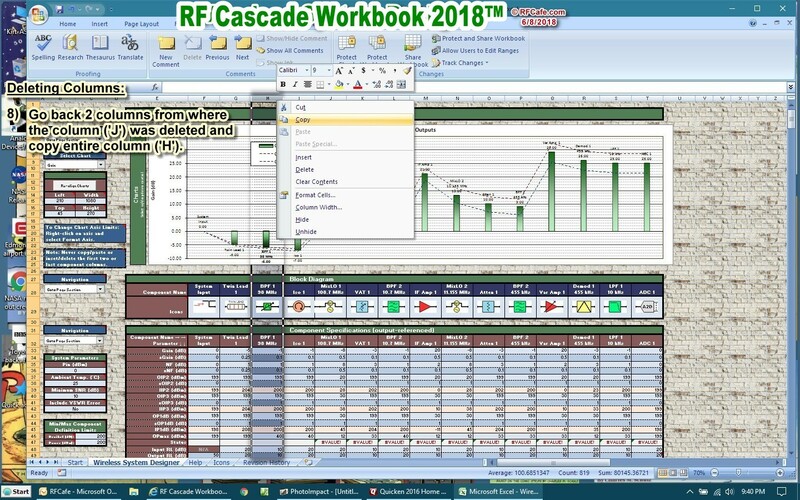 That's an Excel thing, not a RF Cascade Workbook 2018 thing. 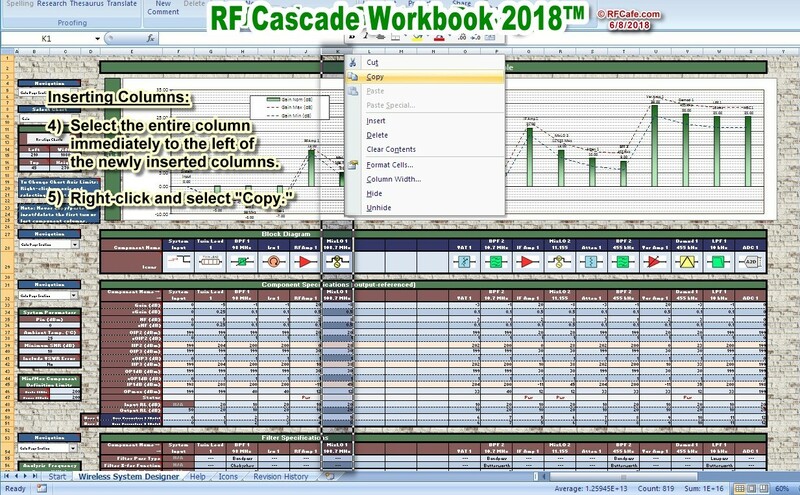 Being a firm believer in the adage that says a picture is worth a thousand words, these annotated screen shots outline the complete series of steps required to assure successful insertion of component columns. Stray at your own risk. 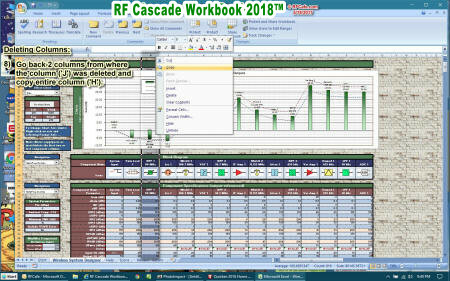 Don't forget to make a backup copy first! Before detailing the procedure for deleting columns, I would like to suggest that rather than deleting columns that you instead set all the input parameters for the column(s) to null values that do not affect the overall cascade calculation results, and then simply Hide the column(s). 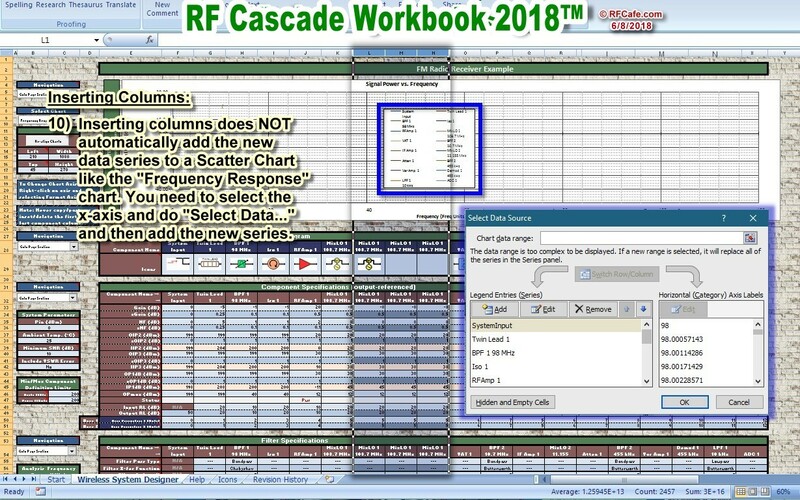 Hiding a column causes it to disappear from the spreadsheet and any values from a hidden column do not appear on the charts. You can Unhide column(s) later if the space is needed. 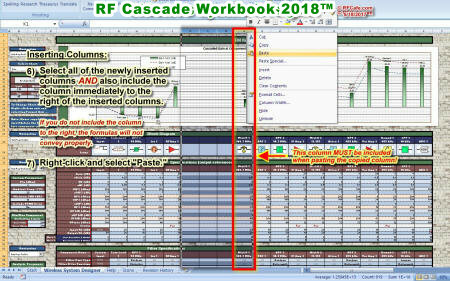 I provide a screen shot of the suggested null values to use. 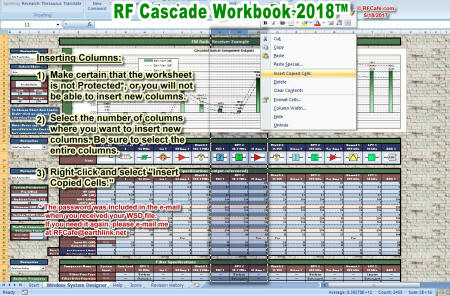 However, if you still prefer to deleted unused columns, the following procedure gets the job done.